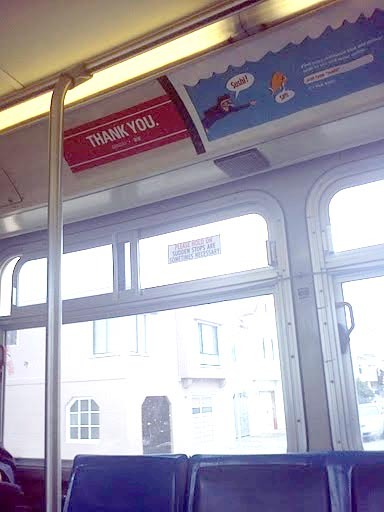 Last week I was riding the good ol’ MUNI here in San Francisco and noticed something interesting: a sticker on the bus from MUNI saying “Thank You” where the advertisements usually are. I snapped a picture of it and sent into one of my favorite blogs, Muni Diaries. Well they published my picture in one of their blog posts and I thought I’d share it! Check out there blog for more about MUNI. Have you ever seen anything interest on public transit? Let me know below!